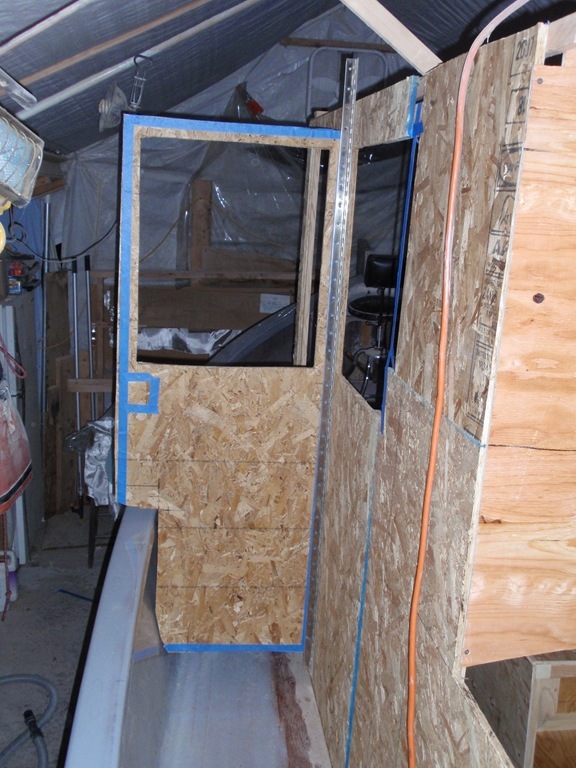 I spent every night this week mocking up the boat cabin, complete with door and seats. I used scrap lumber and an assortment of other cheap material to make a cabin frame for better visualization of placement and spacing. 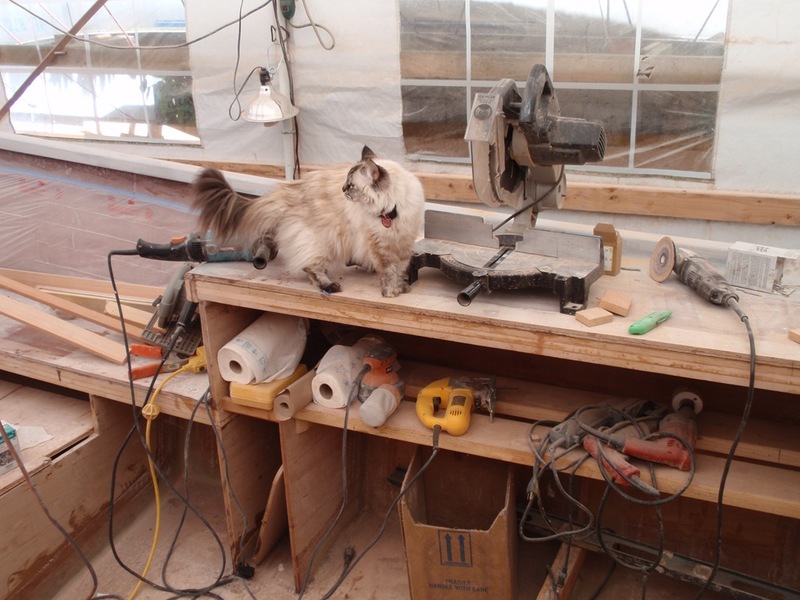 Today I tore it all down so I could get back to building. I’ve always had a fear that things wouldn’t fit, or that some part of the design was unworkable. I’m happy to say I’ll be able to do pretty much everything I was hoping to in the boat. I’m really happy with how it all went together after 2 years of thinking about it. Now I just need to build the thing! Aft cabin and pilothouse. 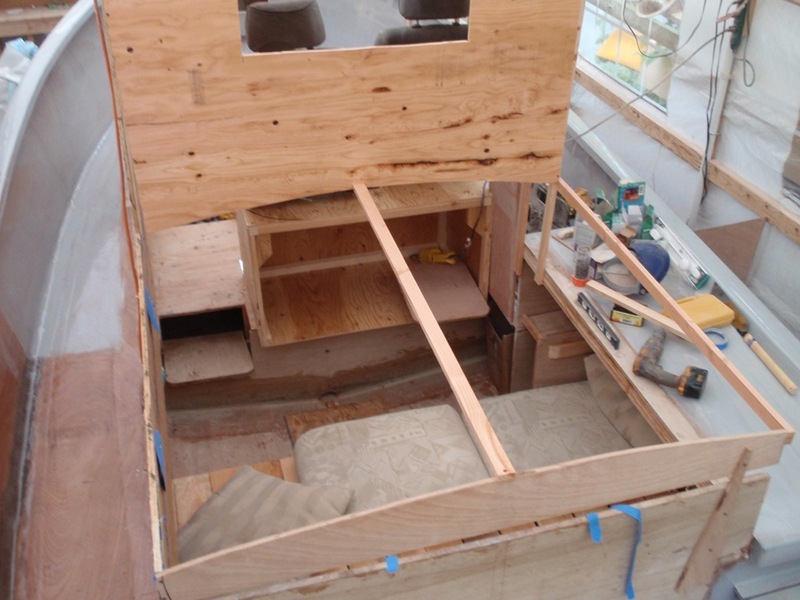 I lengthened the pilothouse by 8 inches from Devlin’s plans to allow standing headroom forward of the bed. I’m concerned about how this will look, but it makes a huge difference in the usability of the aft cabin. I can stand by the bed now (actually with 8-foot headroom). I may add a small round porthole in that blank space on the side. 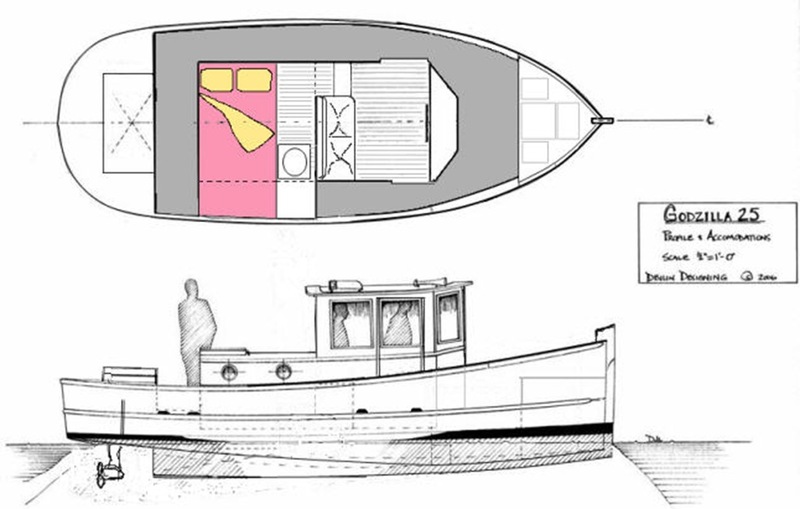 Boat plans. The one on the left is as Sam designed. 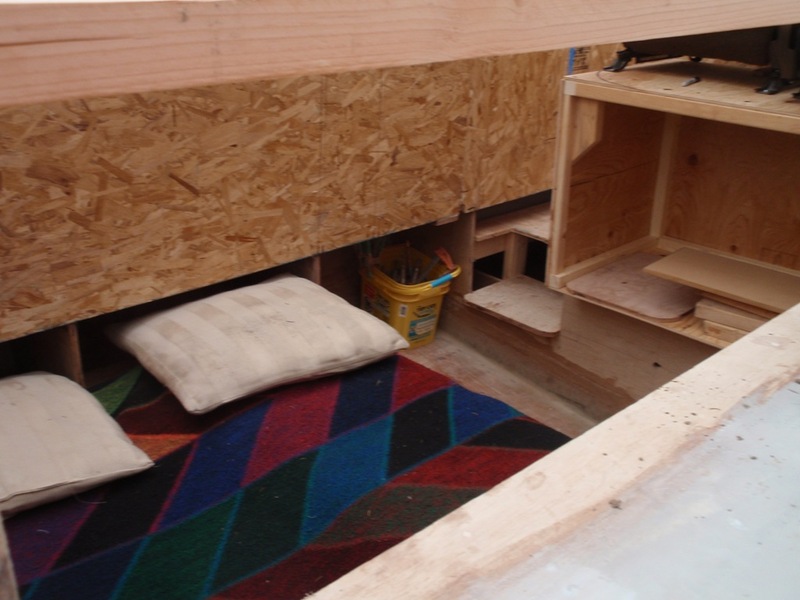 The right picture is what I was going to build – the bed is turned 90 degrees. 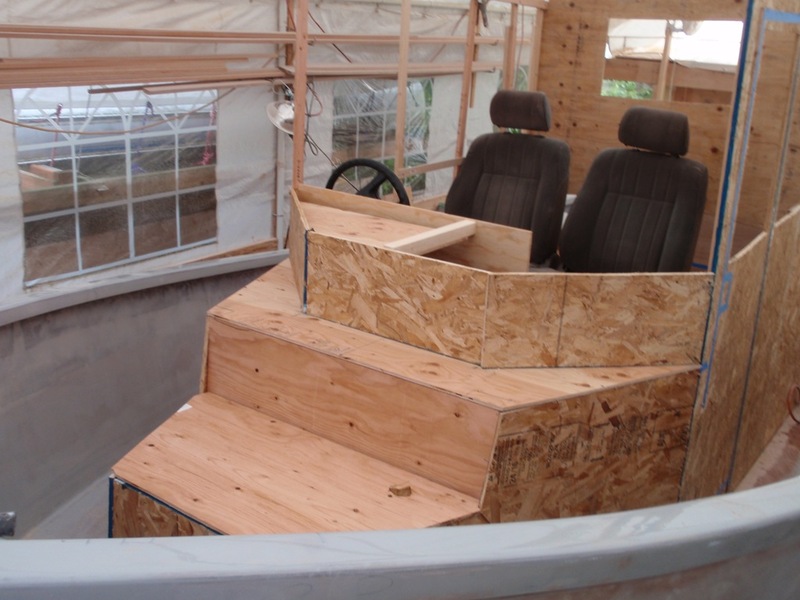 What I’m building now has the head (toilet) moved to a small cabin forward of the steering wheel, and the helm seats moved toward the bow to add space to the aft cabin. The pilothouse is 8 inches longer (toward the stern) than this picture. The plans call for sliding doors. I prefer swinging doors – easier to lock, and easier to make weathertight. To make it work I notched the bottom of the door to clear the gunnel. Of course, there’s a matching protrusion on the jamb. It doesn’t seem to make going through the door any more difficult. 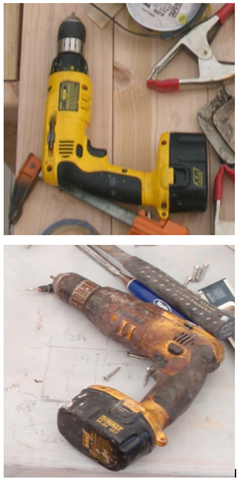 As usual, when I come up with something unusual, I ask the Woodenboat guys and they shoot it full of holes. I may choose to take my chances and ignore them this time. There are thousands of tugs out there with swinging doors. Nifty mocked-up dashboard. Instruments should fit behind it without intruding into the head area (too much). Enough room to lay down a chartbook on the shelf. Aft cabin. 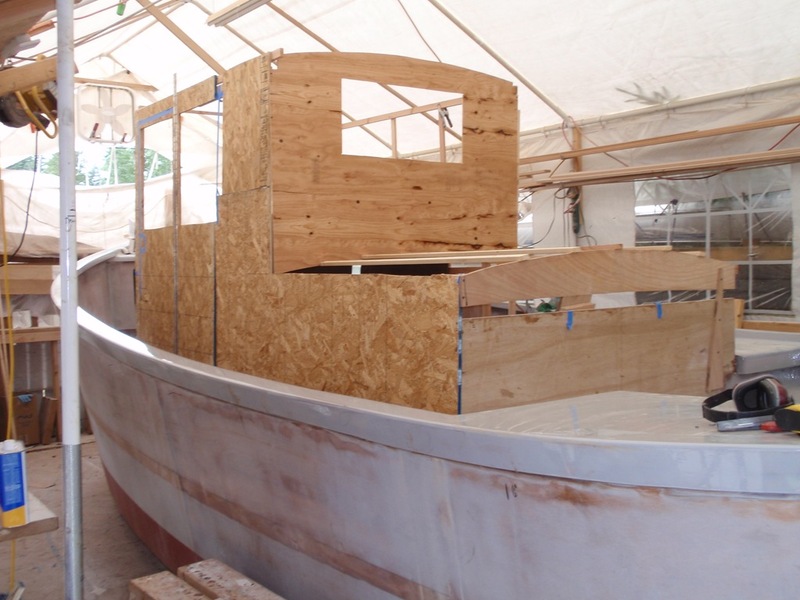 The bed takes a standard double (aka full size) mattress (54″ x 75″), and runs athwartship. Your feet are in a raised area of the side deck. 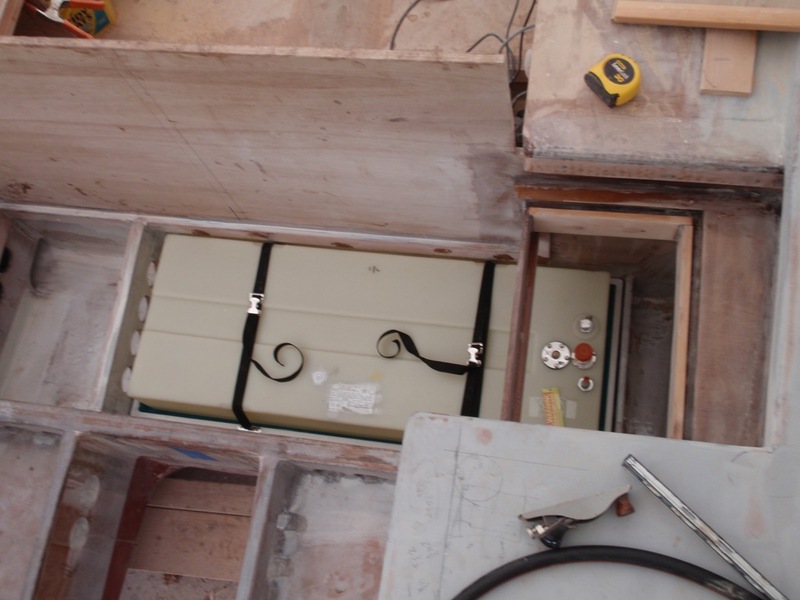 The open box you see in the first two photos below is the galley. 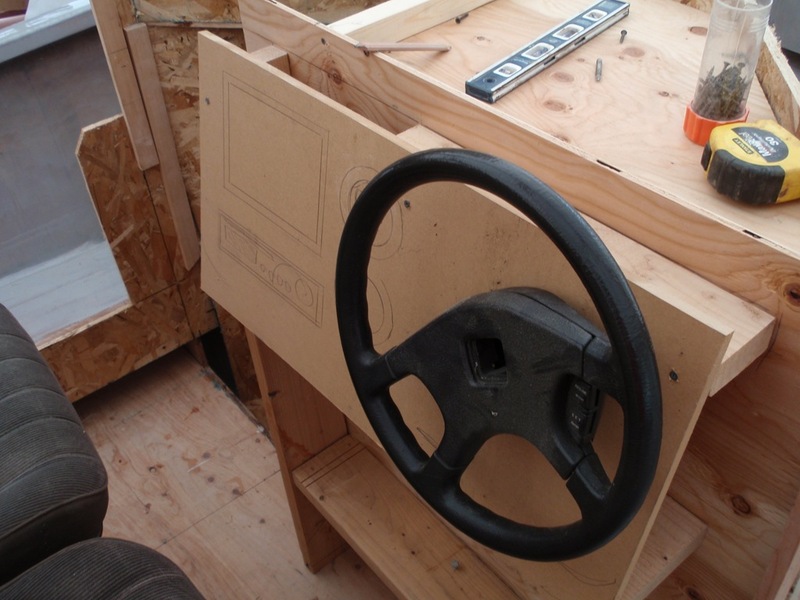 The pilothouse seats mount on top of it. You sit on the edge of the bed to use the galley. 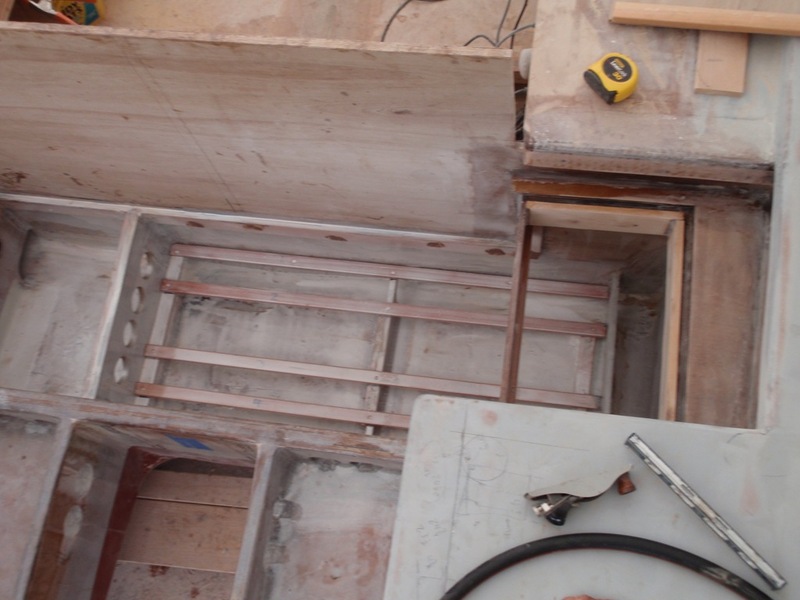 There will be a sink (with pressure water) on the left and a work surface on the right. 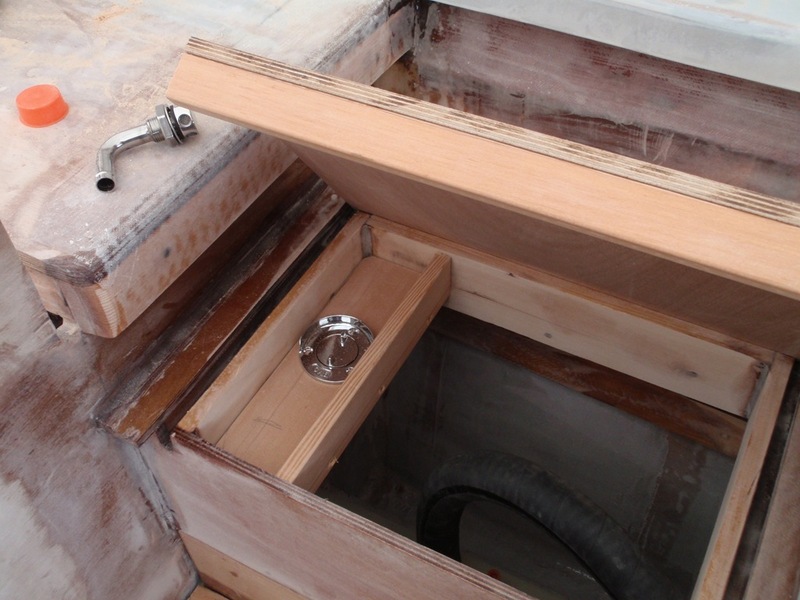 A gimbaled Forespar Mini-Galley stove mounts to the side of the cabin to the right of the box (the Starboard side of the boat). 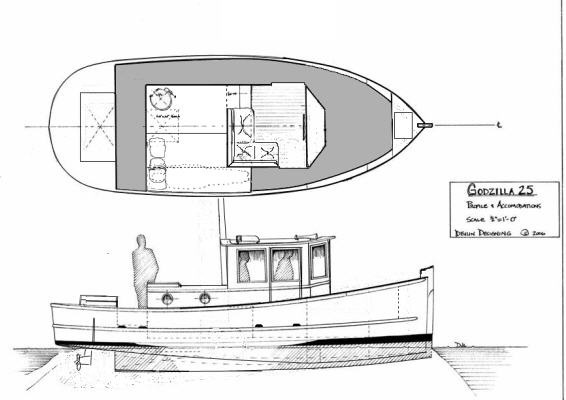 The galley will be used mostly to prepare sandwiches, coffee, tea, and oatmeal. The Dickinson Newport propane heater is mounted above it on the cabin side so we can watch the flame from the bed. 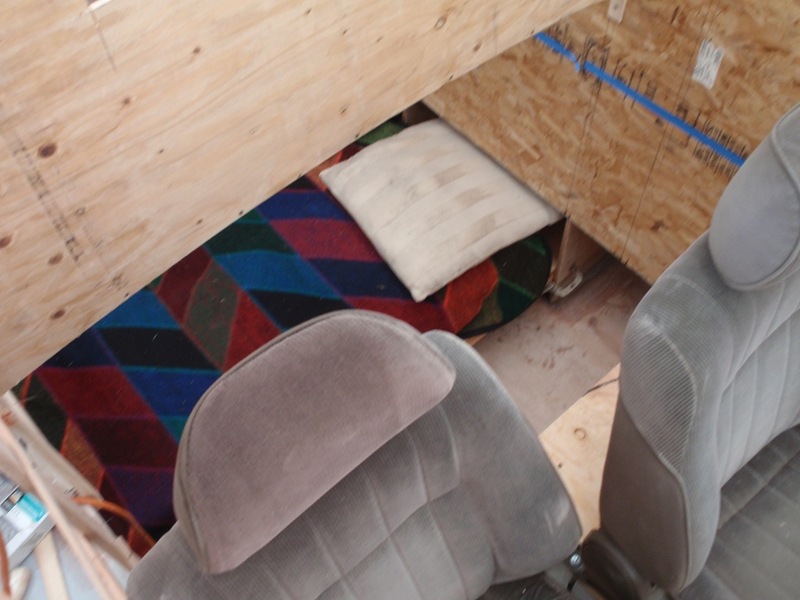 The heater was the other reason to lengthen the cabin – I just couldn’t find a safe place to mount it anywhere else. 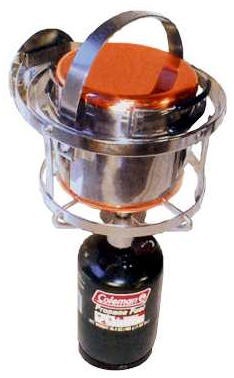 A good cabin heater is an absolute necessity for being able to use the boat year-round in the Pacific Northwest. I’ve been thinking a lot about tire fenders for the boat. I went to the local airfield this afternoon and looked at airplane tires, but they’re really small. They might look funny, and wouldn’t cover as much area as I’d like. I picked up the junked car tire below on the way home. It fits pretty well, but is maybe a little oversized. The coverage is nice – about 4 inches above waterline to just below the rub strake, and it’s deep enough to provide a lot of padding. Maybe a trailer tire would be a better fit. I wonder where I’d find eight of those? I had assumed I’d put three tires on a side, but now I’m thinking four, and maybe five on a side. If you’re going to have permanent fenders, you might as well go all the way! 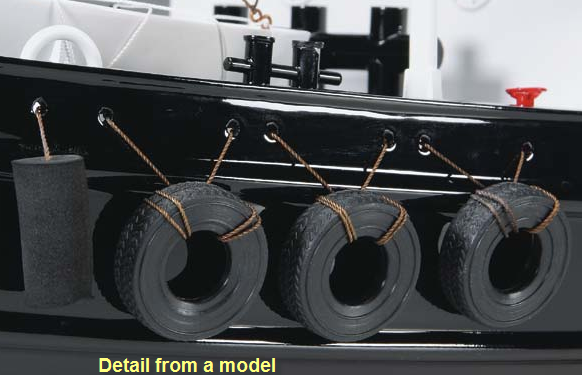 Pictures of small tugs with tire fenders are hard to find on the web. Here are two of the better ones. This is a detail from a tugboat model. I really like the idea of hanging each tire from 2 lines. They’ll be a lot more stable that way, and still be individually removable. Hanging the tires through hawse pipes is really nice, as opposed to running the lines over the gunnels. I used this picture as a starting point for the mockup below. This is a bronze through-hole, mounted just below the gunnel rub-strake. Each of the lines would go to one side of a tire. Tarnished dark against the black hull, it should be pretty subtle, but clean. This is the view from the outside of the boat. Inside, looking up to the gunnel. 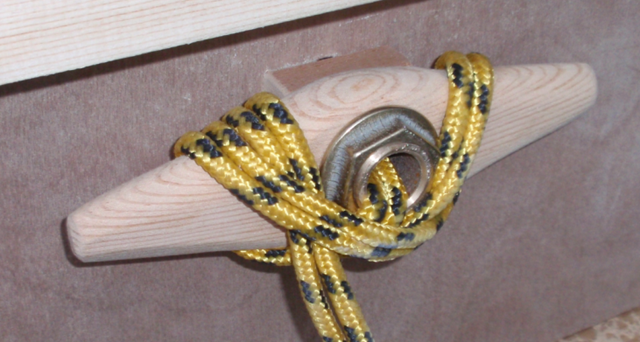 A mocked-up wooden cleat is held on by the through-hull nut. The lines come through the fitting and cleat on. The whole thing fits below the 2 1/4 deep overhang of the gunnel. 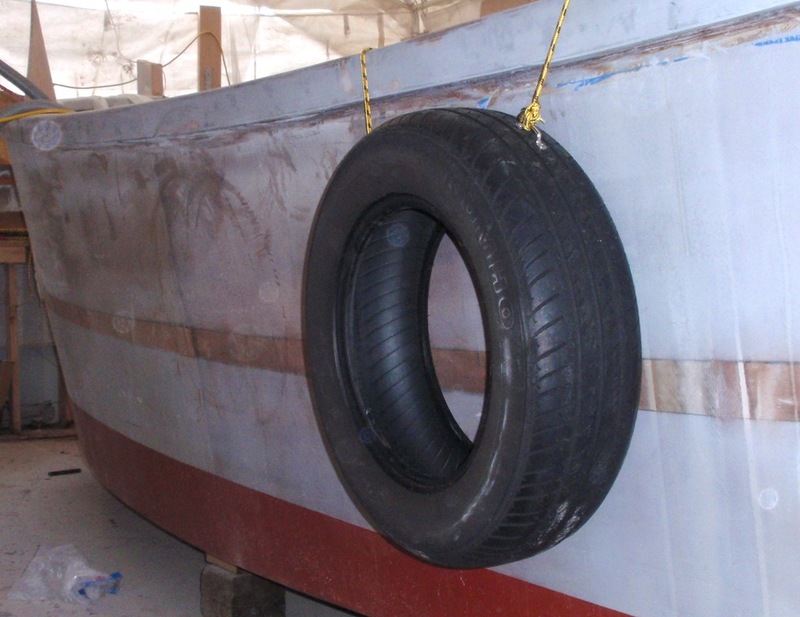 I do worry that the tire fenders will just be the final nail in the cuteness ratio of the boat. I don’t want people to say “Oh, how precious!” when they see me coming, but it might be unavoidable. At the same time, the tires are really practical. Never having to set or store fenders will be really nice. Beware to the white plastic boat that rafts up to us though! I’ve spent the last few weeks working on the gas tank installation and building all the structure under the sole where the tank goes. Basically, I made a big tray, somewhat oversized, for the tank to sit in. (Plastic tanks swell as they fill.) 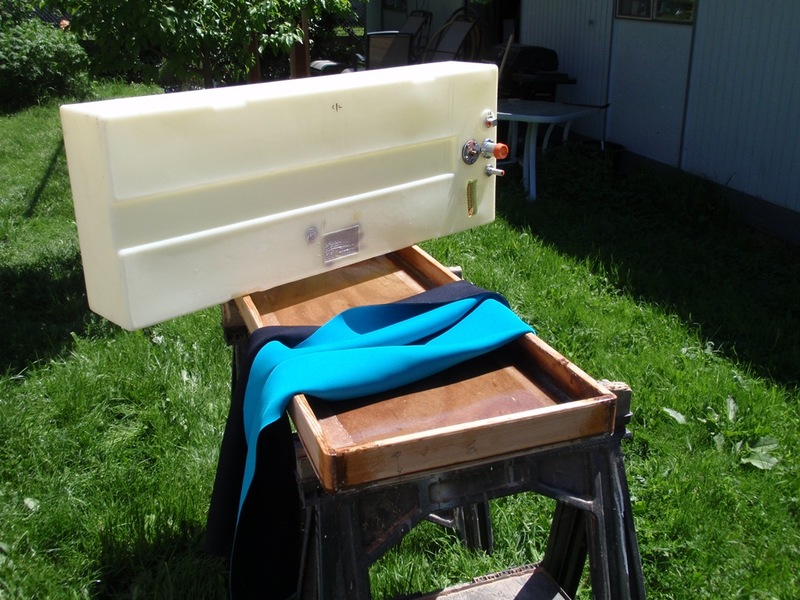 I lined the tray with neoprene for padding and added some nylon webbing to hold the tank into the tray. 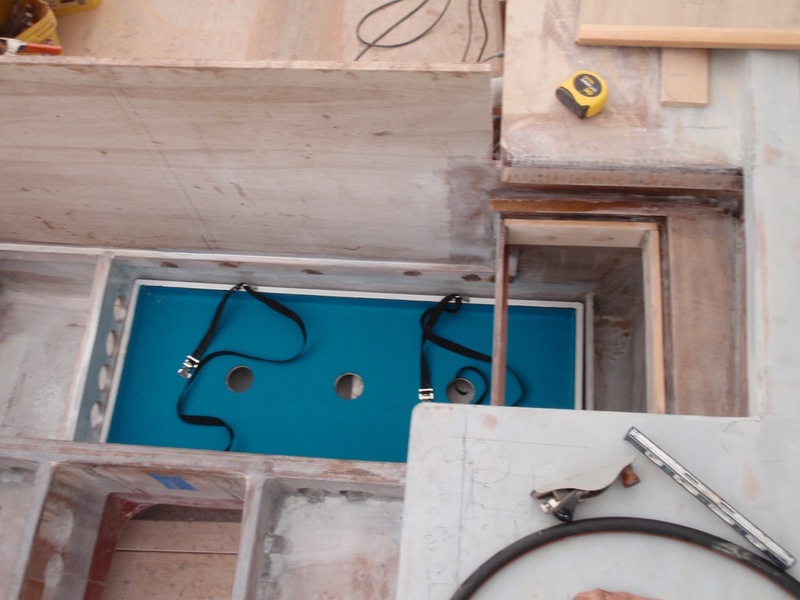 The whole tray lays on four 1 x 2 stringers to keep the tank level. 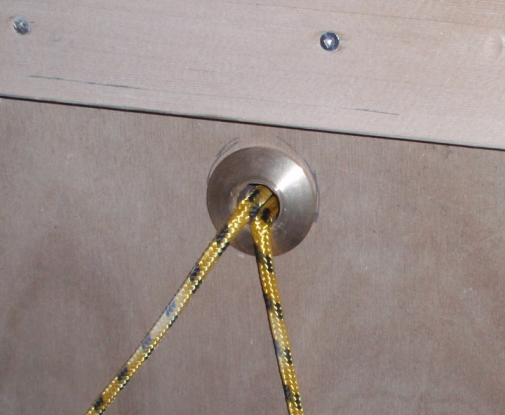 The stringers are attached to some new partial bulkheads under the sole. There are many vent holes throughout to keep gas fumes from building up. 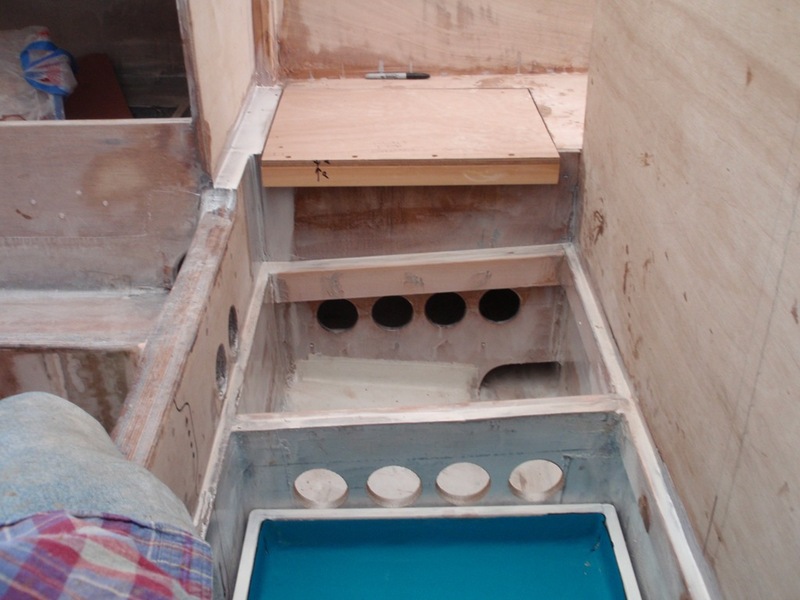 The tank and tray are easily removable to access the hull below. 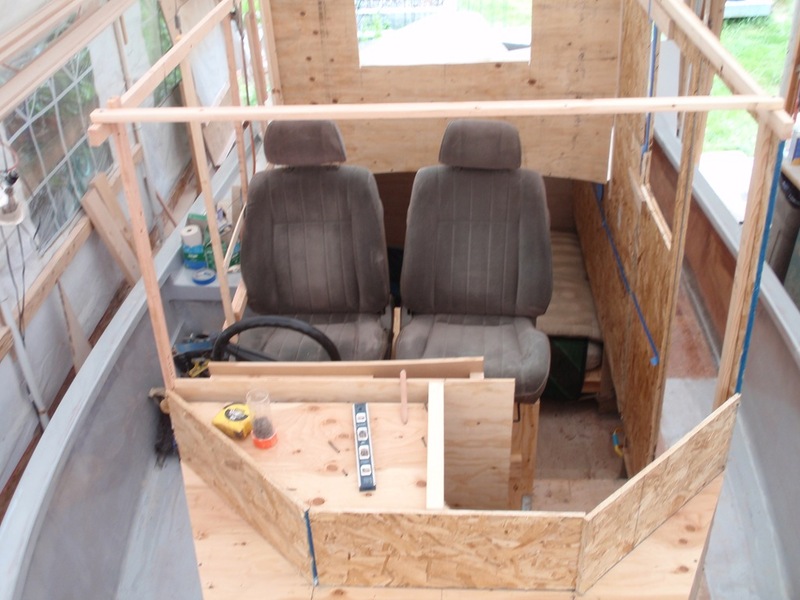 Another weekend of this and I should be ready to prime and paint this area and start working on the inside of the cabin. The tray will catch any drips so you can dispose of them correctly. There’s not much change of spilling gas into the boat or the water.